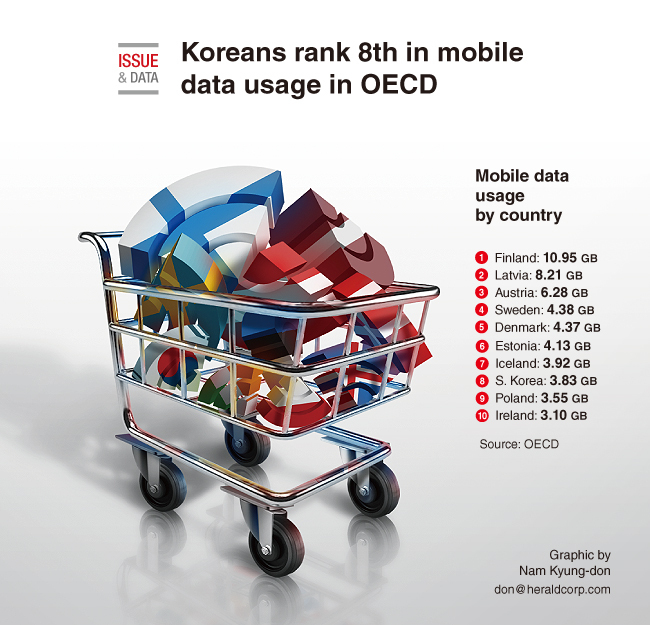 South Koreans used a monthly average of 3.83 gigabytes of data on their smartphones last year, ranking eighth among member states of the Organization for Economic Cooperation and Development, according to a report by the OECD. Finland was No. 1 with monthly data usage on smartphones standing at 10.95 GB in 2016, followed by Latvia with 8.21 GB, Austria with 6.28 GB and Sweden with 4.38 GB. Among the surveyed OECD member states, the Netherlands ranked the lowest with an average monthly data usage of 1.02 GB. The overall average for OECD member states came to 2.3 GB. Separate data showed that the monthly data usage of South Korean smartphone users has increased in recent years partly due to a rise in mobile plans that offer unlimited connectivity by the country’s mobile carriers.